The official start of autumn is this coming week. But other than the changing of the light, there has been little indication from the elements that we are approaching fall. September has, for the most part, been unusually warm. Even during the week of rain we had earlier this month, it was a warm rain…it didn’t have the chilly feel that a spate of September rain usually brings. And although I love fall, I’m not complaining. I love summer too. I mostly point all this out to say that the foods of fall have snuck up on me. The market is beginning to fill with pumpkins, hard winter squash, apples, pears and cool season root vegetables (ready for harvest because of the waning of the light I would imagine…). But I am still hungry for the foods of late summer: fresh tomatoes, corn, summer squash, green beans, etc. And thanks to the warm weather they are still in good supply. So in the spirit of this moment, today I am offering a cool, late summer farro salad…filled with corn and tomatoes. 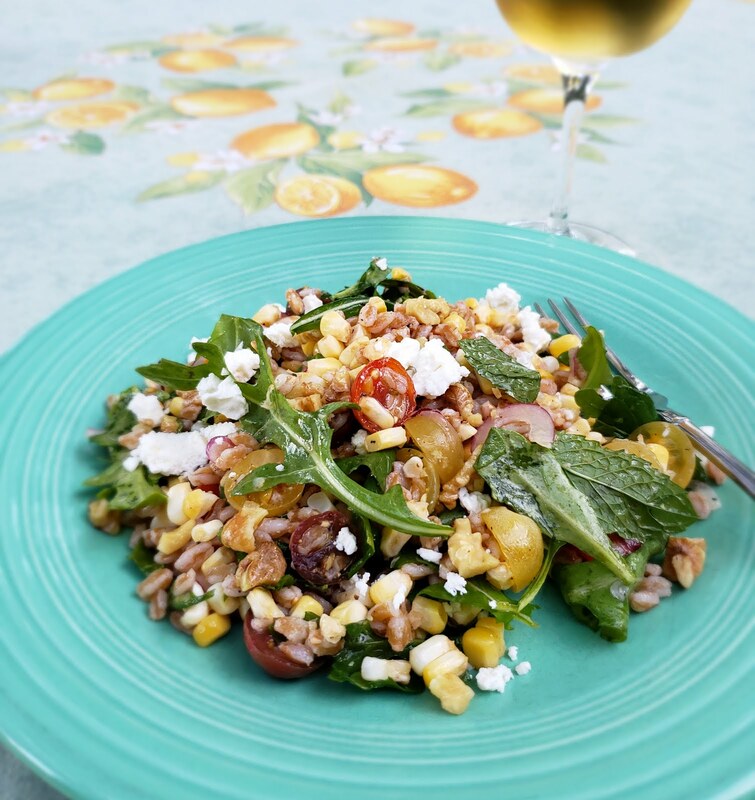 The calendar may soon say “fall,” but I anticipate being hungry for this salad for as long as the corn and tomatoes keep coming into the market (easily for another couple of weeks…). The dish is a loose adaptation of a recipe in a recent addition to my cookbook library: the insightfully named Six Seasons (by Joshua McFadden). The premise of the book is that summer—at least as far as food is concerned—is really three seasons. Early summer includes tender young root vegetables and the tail end of the spring crops. Midsummer is the season of melons, cucumbers, summer squash, several brassicas (cabbage, broccoli, cauliflower, etc), and green beans. Late summer brings the full flush of tomatoes, peppers of all kinds, eggplant, sweet corn and shell beans. Depending on where you live, his breakdown of the harvest will be slightly different from yours (in the Midwest, for example, I can get delicious local sweet corn all summer long), but in general, I love the idea behind his book. I have always felt like “summer” was too vague a definition of the harvest. Almost since I began teaching, my summer roster has included farmers’ market classes designated “Early,” “High,” and “Late” Summer. Not only are the crops different, but each mini-season has a particular feel to it. He captures and explains all of this very well. Needless to say, I’m really enjoying this book. I altered his farro and corn salad to suit my pantry. He includes scallions, which I don’t tend to keep on hand. But I always have red onion in my pantry…and I love it thinly shaved in salads. The recipe calls for handfuls of basil and mint. 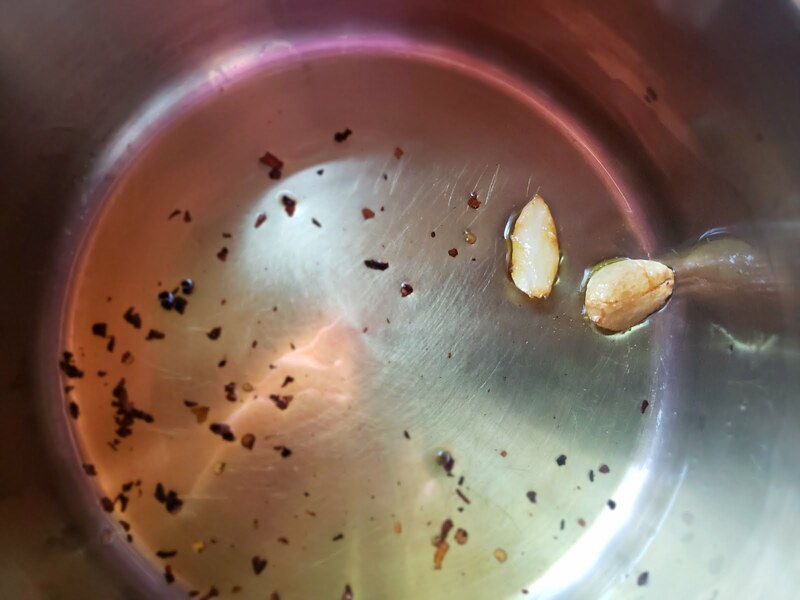 Unfortunately my basil had succumbed to a fungus the week before I ran across this recipe. But I happened to have some lovely arugula—which is my usual stand in for basil during the spring and early summer months. 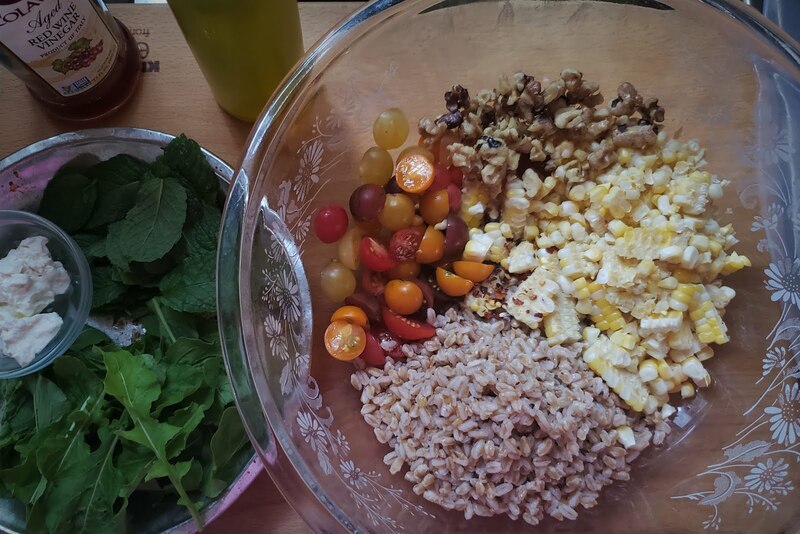 I thought it worked very well in this salad. Finally, McFadden adds torn croutons (similar to those that I prepared for my BLAT salad a few posts back) to give some texture. I didn’t have any of the right kind of bread thawed (and I was rushing to get dinner on the table), so I achieved a bit of crunch with a few lightly toasted and crumbled walnuts. They were just the thing. 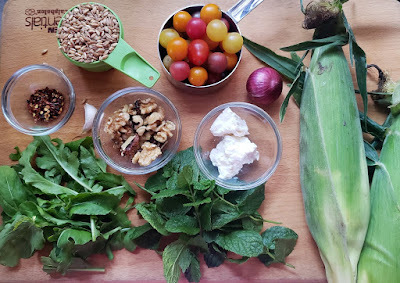 And finally, I gilded the salad with a shower of crumbled Feta—whose salty, tangy presence makes one of the best summer salad garnishes imaginable. I’m sure the original salad was good…but I loved my version. This salad was not just delicious... Like all good food, it was right for the moment. It was filled with the vegetable fruits of the current season: the last of the sweet corn, the final abundant flush of cherry tomatoes, and fresh mint from my garden (newly invigorated from a recent week of rain). And it came together quickly on a day when I was short on time and much more in the mood to be out of doors enjoying the tail end of the warm summer weather than in a hot kitchen cooking. I guess I'd have to say it was just about perfect food for the tail end of summer. 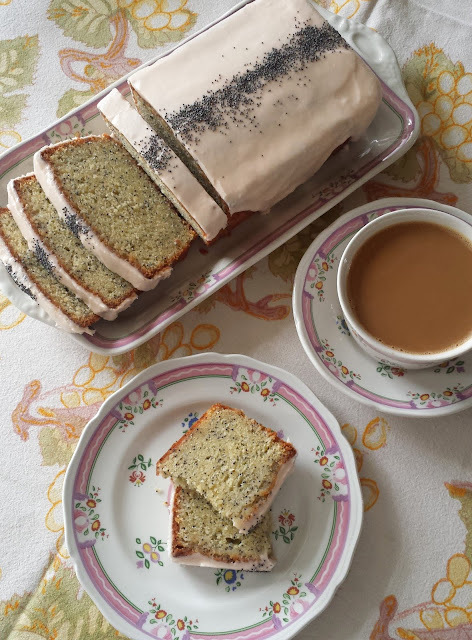 If you have the ingredients on hand...and you are still experiencing a spell of warm summer weather...you should definitely give it a try. I have given measured amounts of all of the components of this salad because I know a lot of people like exact amounts, but this is definitely a “to taste” kind of salad. Please view the measurements as guidelines and adjust to suit your taste… More or less onion… More or less mint… Etc…. In a wide saucepan with a tight fitting lid, warm the olive oil over moderate heat. Add the garlic cloves and pepper flakes and gently cook for a few moments until the garlic starts to acquire a light golden color. Add the farro and stir to coat in the oil. Continue to cook for 3 to 5 minutes, stirring pretty much constantly. 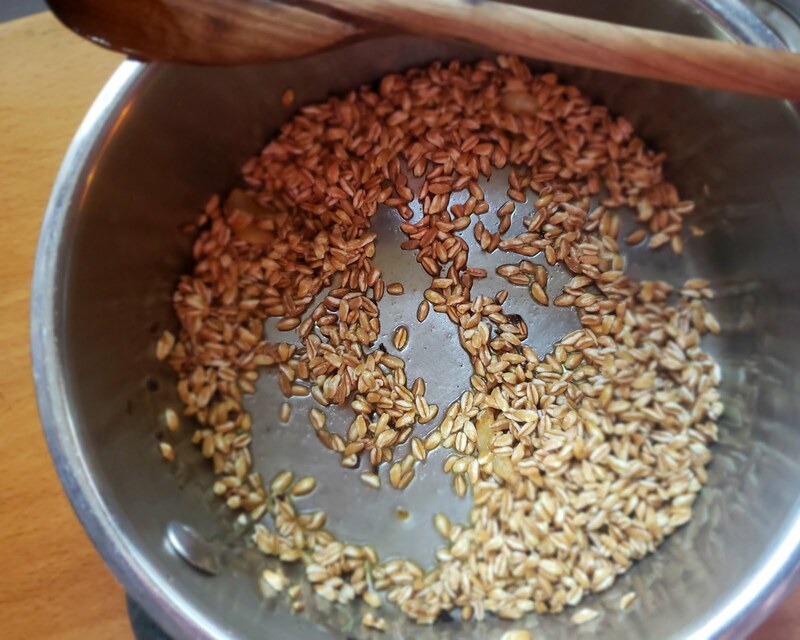 The farro will begin to darken and give off a toast-y aroma. Add the water and salt and bring to a boil. Cover and reduce the heat to low. Cook until the farro is tender, but still has texture—anywhere from 20 to 35 minutes, depending on the type of farro you are using. 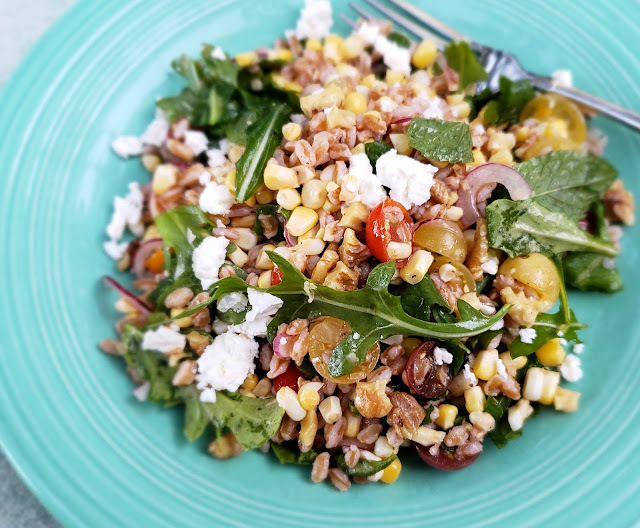 Let the farro sit off the heat for 5 minutes. Drain well and spread on a sheet pan to cool. If you’re in a hurry, place the sheet pan in the fridge. 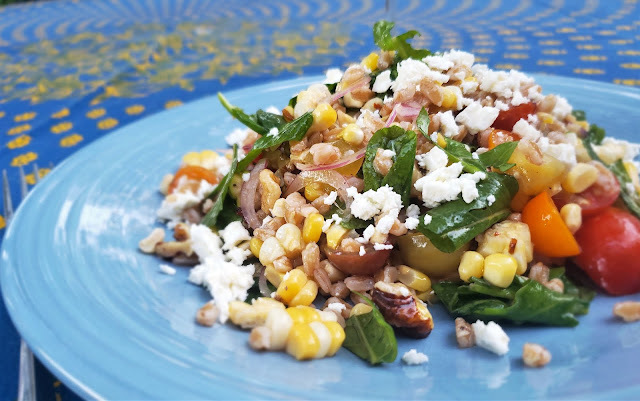 If you are roasting the corn, you may do so while the farro cooks. Place the corn in the husk directly on the rack of a 375° oven. Roast for 20 minutes. Remove the corn from the oven and using towels to grab the corn, peel the husks back and allow the corn to cool on a rack. When cool enough to handle, remove the silks. If using raw corn, simply remove the husks and silks. Cut the kernels away from the cobs and use the back of your knife to scrape the cobs clean of the milky pulp still embedded in the cob. You should have about 3 cups of kernels. While the farro cooks and the corn roasts, cut the core out of the onion and slice very thinly lengthwise (preferably with a mandolin slicer). You should have 1/3 to 1/2 cup loosely packed sliced red onion. Place the onion in a bowl and cover with ice water. Let sit for about 15 minutes. Drain well and blot dry with paper towels. When all the components are ready, place all of the ingredients except the olive oil and Feta in a large bowl. Toss to combine. 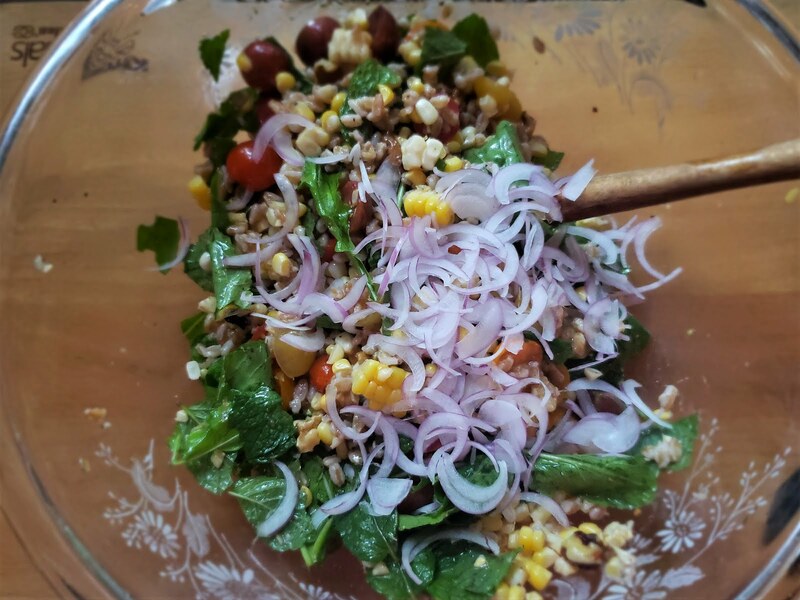 Taste and adjust the seasonings so that the salad is vibrant. Drizzle in the olive oil and toss. Taste and adjust again. Serve chilled or at a cool room temperature. When ready to serve, mound on individual plates or a serving platter and scatter the Feta over all. Serves 4 to 5.